Imagine a situation where you have to sign huge documents that need to be sent to the client or business partner? It could become a tedious task if it had to be done manually. You have to get a print, sign the document and then scan it and send it. This process continues for every document that needs to be signed. In case you make a small mistake, you have to repeat the process again. Wouldn’t you rather there was a hassle free method to get this task done? To overcome this type of problem, we came up with Sign It! ‘Sign It!’ is a simple e-Signature application which facilitates users to sign their important documents anywhere, anytime in just 2 steps. It provides an easy way to sign any document, and share the signed documents with anyone via native sharing options. The Sign It! smartphone application has been exclusively designed and developed for iPhone, Android and Windows Phone 8 platforms. The app allows you to crop the document, add signatures by selecting different colors. You can also save the signatures for immediate use & protect the signatures with the help of a password. 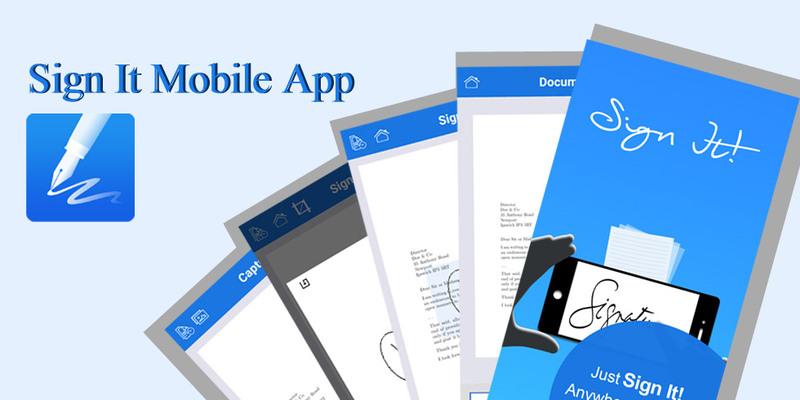 The app helps manage your previously signed documents in offline mode. A multi-platform Sign It! app allows you to use it on any device compatible with iOS, Android and Windows Phone platforms. You can add signature by capturing the document using your camera or by selecting the image from Image Library. Once you have the selected image, you can add signature to it. Crop the selected image portion of the document as per your requirement and add the signature to it. Rotate captured or selected image to left or right prior to adding the signature. Add Signature on captured / selected image. Also Move / Resize the signature on the document. Change the color of the signature from the available colors such as: Black, Blue & Red. Authenticated and secure access to your signed documents by following a simple registration process. Create PIN after installing the application for the first time and secure your saved signature. Allows sharing of your signed documents through SMS, Bluetooth, Emails, Chats, Native Apps and even on Social Networking Sites. It allows you to capture/browse, sign and save the documents in offline mode. The Sign It! application is available on iTunes, Google Play Store & Windows Phone Store for free to download. Download Now!! Semaphore Software is a leading Mobile apps development company. We offer specialized Android app development services. You can contact us through info@semaphore-software.com to know more about the services we offer.